The nerdy humorist and author proves infectious. 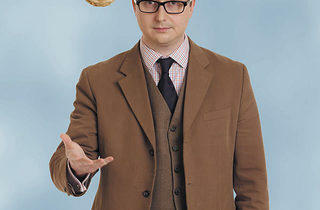 Photograph: Jan Cobb GEEK CHIC Hodgman proves it's hip to be square. 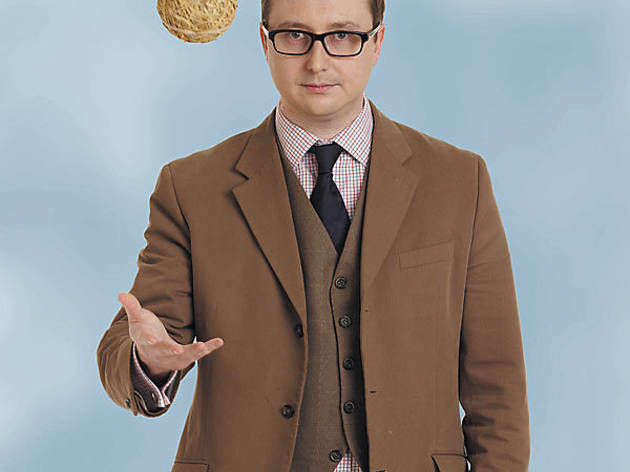 For John Hodgman, it’s revenge of the nerds. After working as a freelance magazine writer and literary agent, the 38-year-old Brookline, Massachusetts, native and self-proclaimed “minor television personality” finally has his spotlight with a residency on The Daily Show, appearances in Flight of the Conchords and Battlestar Galactica and two best-selling almanac-style books chock-full of fake facts (The Areas of My Expertise, More Information Than You Require). Armed with dork cred and Sahara-dry humor, the face of fuddy-duddy PCs (in the ubiquitous Mac commercials) brings an arsenal of faux trivia to a sold-out gig at the Chicago Humanities Festival on Tuesday 10—despite asserting in his last tome that Chicago doesn’t actually exist. Well, I am an expert in everything…except sports. I know that so-called Chicago is a so-called sports town with your fake teams, your young bears and your grown-up bears, but I am not required to add more to the conversation on sports. So you still believe Chicago isn’t real despite the fact you’re speaking here? I was really impressed the past couple of times I’ve been to quote-unquote Chicago at the amazingly lifelike city that you built in order to trick me into thinking that it was real. The people of Illinois obviously are very adept at putting together pretend cities, and I’m looking forward to seeing what you guys come up with this time. Both your books are pretty damn random. How do you begin? Do you just sit around brainstorming things like how to cook an owl? I collect a lot of old books of trivia, world history, cookbooks. There was a great book that someone gave to me called Louisiana Cookery by Mary Land in which she had a whole section on things like squirrel-head pot pie—not a joke—and how to cook crows. You never think of owl as a thing you would eat until you’re starving and living in Louisiana during the Depression. Then I started thinking about what would be my own recipe for cooking owls. What do you think it’d taste like? Probably a lot like raven. I read that you and Wu-Tang Clan producer RZA share the same publisher. Have you met? No, but I feel like if you did, the clash of personalities might open a time warp. I think you should be much more frightened about me and, say, Mo Rocca ever meeting. It would be a nerd singularity. I passed him on the street once. I really felt physically ill, like Obi-Wan Kenobi when Alderaan blew up. With so many terrible shows out there (Secret Girlfriend, we’re looking at you), does it seem as if comedy is getting dumber? A survey would show an incredible diversity of content that would span the entire dumb-o-meter with many of it reaching into the red zone of perilously smart. There are more venues through which people can reach a wider audience than ever, using a machine that I invented called the Internet…. You had Andrew Dice Clay selling out Madison Square Garden in 1987. You’ve got Dane Cook selling out Madison Square Garden today. It seems to me like we’re on a pretty even keel, and we might even be headed up from there. Does Al Gore know you’re taking credit for the Internet? I copyrighted the Internet, and as a result, I can’t disclose the terms of the settlement, but Al Gore has to come to my house and make dinner. I can’t tell you how often, but I can say that his Alfredo sauce is the best. The Chicago Humanities Festival continues through November 15. For more info, visit chicagohumanities.org.